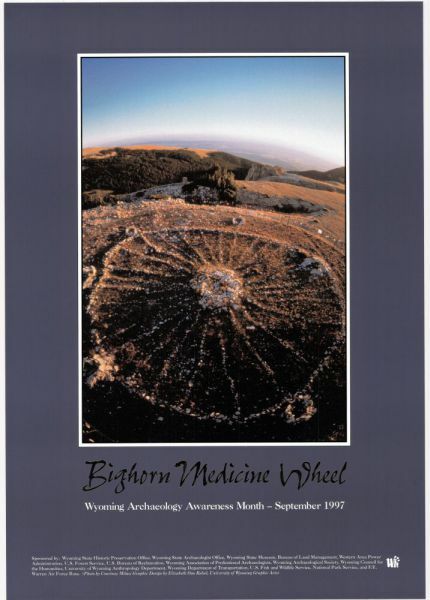 The Bighorn Medicine Wheel is located near the crest of the Bighorn Mountains in north central Wyoming. The Medicine Wheel was designated a National Historic Landmark in 1970. It consists of a circular alignment of limestone boulders that measures about 80 feet in diameter and contains 28 rock spokes radiating from a prominent central cairn. Six smaller cairns are situated on the exterior of the Medicine Wheel. Tipi rings, lithic scatters, buried archaeological sites, and a system of relict travois trails are found nearby. Researchers generally believe that the Medicine Wheel was constructed between 300 and 800 years ago. Other archaeological evidence recovered from the alpine landscape that surrounds the Medicine Wheel indicates the locale was used by prehistoric Native Americans beginning almost 10,000 years ago. To contemporary Native Americans, the Medicine Wheel and the surrounding terrain constitute a uniquely important and sacred landscape that figures prominently in tribal oral and ceremonial traditions. To Indian people, the rock alignments and cairns that comprise the Medicine Wheel represent religious architecture rather than inanimate archaeological data. The ethnographic and archaeological sites that occupy the Medicine Wheel National Historic Landmark express anthropological values bound by the common thread of centuries of use by Native Americans. It is one of the very few historic reserves in the United States where the prehistoric past and ethnographic present are unequivocally linked. A study is underway that will establish Landmark boundaries that not only encompass the numerous individual ethnographic and archaeological sites, but also portray the compelling landscape in which the Medicine Wheel is found.